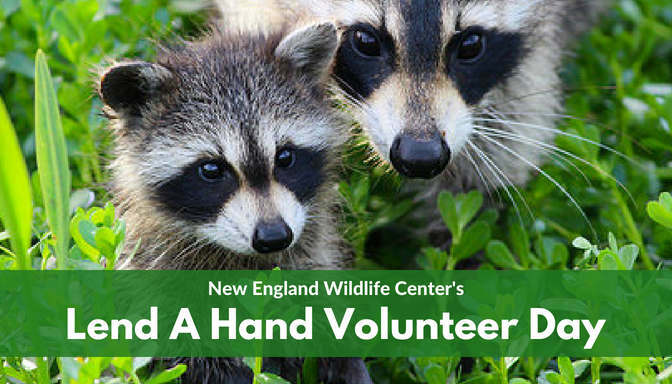 New England Wildlife Center invites members of the community interested in volunteering to come help get the Center ready for the summer rush of wild patients and visitors during our Lend A Hand Volunteer Day! REGISTRATION REQUIRED! Email Erica Burrows at Erica.burrows@newildlife.org. ALL CHILDREN UNDER THE AGE OF 14 MUST BE ACCOMPANIED BY A PARENT OR ADULT GUARDIAN. We’re coming up on one of the busiest times of year at the Center, and we’re expecting thousands of animals and people to come through our doors this summer. NEWC has a small, dedicated staff, and this is a time when we can use a helping hand! Every hand we can get in getting the Center ready for summer is a BIG HELP and makes a HUGE DIFFERENCE to wild patients, education animals, and visitors. Refreshing habitats and exhibits in the Weezie Nature Center. Repairing and cleaning outdoor turtle enclosures. Pick up and clean up patrol on the Andrea McKenna Harris Nature Trail. Weeding, organizing, and picking-up outdoor areas. And there’s more projects to come! Bring your own lunch for our group lunch break and we’ll provide popsicles and cookies to celebrate a job well-done at the end of the day! To help us organize work teams, projects, and popsicles, please email Erica Burrows at Erica.burrows@newildlife.org to register for the Lend a Hand Volunteer Day now. We hope to see you on June 10 and thank you for making a difference for wildlife!